Fluoman was born in 1952; his early works take their inspirations in the Post-impressionnist movement - Paul Gauguin, Toulouse Lautrec - or in modern artists, such as Yves Klein or Francis Bacon on his works on colours and the pictorial space. Two important worlds have conditioned his career: Africa and Music. 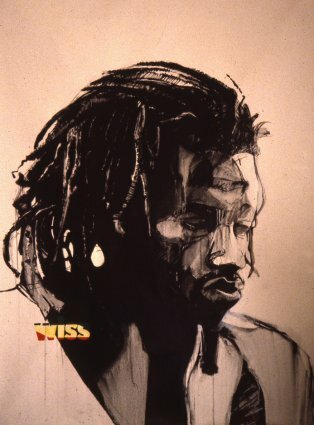 He found the synthesis of both in discovering reggae and its message: the return to Africa. 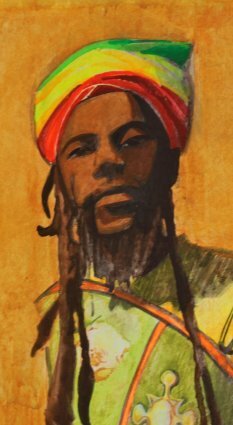 In the 70s, Fluoman discovered reggae music and the Rasta movement, and since then devoted most of his works to them. 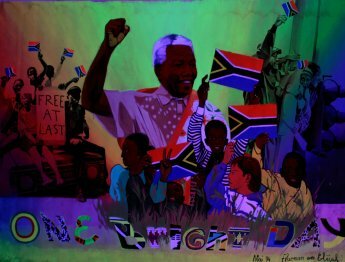 His unclettered paintings, tinted with music, are a historic expression of the international emergence of this movement. 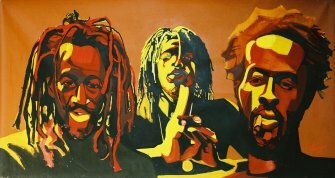 He was one of the pioneers of the French rasta culture. 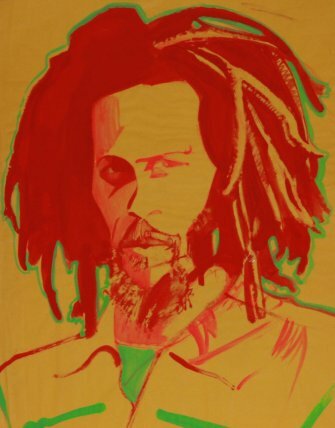 In addition, he was one of the founder of “Jah Live”, a French label for which he made most of the record covers. This label set up many reggae concerts in Paris which were most of the time the first French concert for their Jamaican artists on stage (Culture, The Congos, Ras Michael, Lone Ranger…). During these concerts Fluoman exhibited paintings in the background and lighted them up behind the show. 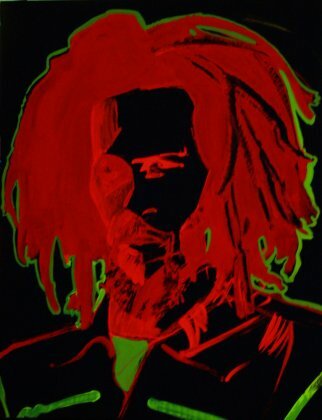 He called this fluorescent live lighting technique “Fluo Sound System” or “Fluo System”. 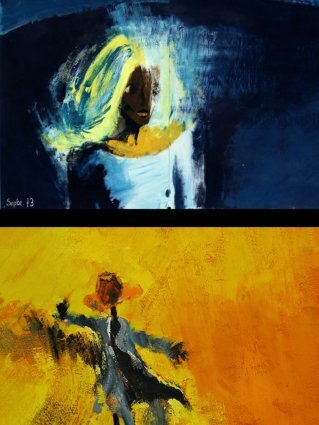 This term gave birth to a short film, (“Fluo System”) directed in 1981 in collaboration with Ulysse Laugier, which shows the lighting mixing possibilities on these paintings. 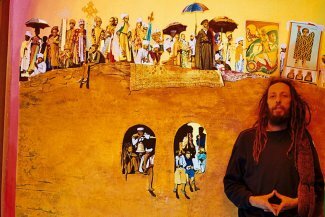 In 1980, Fluoman went to Jamaica, and made a fresco wall at Tuff Gong, Bob Marley’s dwelling who he had personally met few months before during concerts in Paris. 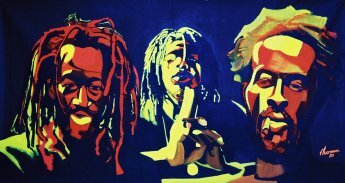 After Bob Marley’s death, which triggered the end of the golden age of reggea in France, Fluoman looked for inspirations in Africa, where he had spent his childhood. In his « African work », Fluoman has two sides : a painter of African landscapes and everyday life; and a violent lampoonist against every political racial segregations. 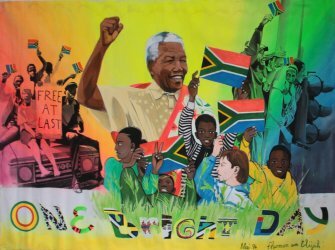 «As long as the apartheid is not over, I will continue to work on it» (extract from an interview of Fluoman in August 2005). Each painting must be an extract from reality, strongly topical. In the 90s, Fluoman concentrated on Ethiopia and created a new simple graphic design. This design is naive or extremely meticulous, and based upon a personal vision on Ethiopian Coptic art. It was the time when he decided to dedicated his life to his art and moved to Marseille in the 2000s. Marseilles, as a melting pot, is an inspiration for the artist. He made a set of paintings on Marseilles seashores that every inhabitants would easily recognize. Far away from the world of art, he spends all his energy into painting, he painted for the people, and for posterity.